Erin May lives in Atlanta, Georgia with her husband, Brian Fletcher, their two beautiful children, Jack and Nora, and two dogs, Charlie and Sage. She was raised in the suburbs of Atlanta and was encouraged from an early age to play in nature, explore her creative side and to love all living things. As a child she loved to build forts, play in creeks, practice Tae Kwon Do, and draw. Drawing classes began in elementary school and would set the stage for a future interest in the arts. It was the first of many stepping stones. College life allowed Erin the freedom to explore new interests and develop her personal aesthetic. She studied sculpture and was enthralled by the creative process, spending many all-nighters in the studio where time seemed to disappear. It was here that seeds were planted and Erin began to mold her future. She experimented with steel, bronze and aluminum and came to love the metals. She cast, cut and constructed pieces and fell in love with the welding process. It was like magic. In 1992, while studying abroad in Italy, an attack of appendicitis sent Erin home. Homebound in Marietta, Erin took a retail job at a charming small boutique (Veronica's Attic) that would change the course of her life. The boutique specialized in hand-crafted jewelry and clothing and exposed Erin to the world of fashion and design. It allowed her to peek into the cottage industry of many small designers and to observe how they operated. Erin soon became a buyer and co-owner of the boutique. Her design background gave her an edge, and she bought goods from rising stars in the jewelry and fashion industry. She attended world-class trade shows and put her boutique on the map as one of the best in Atlanta. In 1997, after many wonderful years in business, Erin and her partners decided to sell the shop and open the door to new opportunities for personal and professional growth. It was a time of transformation. Erin returned to the classroom in the fall of 1997 and began working towards her BFA in jewelry design and metalsmithing at Georgia State University. She enjoyed working with silver, gold, precious and semiprecious stones and more unconventional materials such as plastic and glass. During this time, she won many awards including the 2000 Niche Honorable mention award for hollowware and was a finalist in the 3M National Metalsmithing Competition. In 2001 she graduated. It was a time of rest. In the fall of 2001 she married her long time love, Brian Fletcher and became a wife. She took time to cook, clean and enjoy the simple pleasures of domestic life. She discovered gardening and took long walks. It was a time of bliss. 2002 was a year of creative experimentation and the development of refreshingly new designs that would soon become Erin May jewelry. 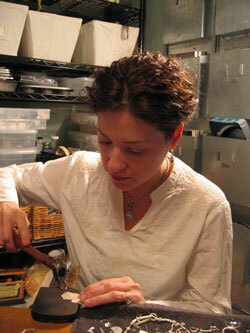 Erin set up shop at home and began working with vintage mother of pearl and abalone buttons. She cut them, carved them, stacked them and set tiny semiprecious stones on top of them. She enjoyed giving the buttons a new life with a new purpose- to be admired for their beauty and not for their utility. Other materials soon crept into the design process, as rayon fibers were woven through silver bezel cups and silk ribbon was hand knotted into beautiful choker necklaces. She incorporated a mix of chains into her designs and played with various methods of oxidation that would give her work an aged patina. She began using raw diamonds, photography and engraving as a means to communicate through her work. Everything fell into place and Erin May jewelry was launched in 2003. It was and is a time of work.